Larger earrings are easily worn on their own, without a necklace...or worn with a matching necklaces to really make a bold statement! 3 inches long, 1-3/8 inches across, a graceful loop of nontarnish brass wire is covered with faceted SILK JADE and SMOKY QUARTZ cut cubes, a vine of blue/gray seed beads around them. Dangling at the bottom are cut IOLITE in dark violet blue, SMOKY QUARTZ in dark brown, and CHALCEDONY in milky white. A chain tassel at the top, earring hangs from goldfill earwire, and they are lightweight! SAPPHIRES in a blue-violet color cut into 4mm rondelles on top, and 6mm on the bottom, are beaded into circles with golden beads, larger 10-12mm CITRINES in clear-champagne color accenting the bottom of each circle. Goldfill chain fringe at the bottom, earrings are 4 inches long including goldfill earwire, up to 7/8 inch across larger circle. Because of the larger size of the stones, these earrings are just a bit heavier than other Jen Earrings. Non-tarnish brass wire is beaded with tiny PERIDOT and bronze beads for loops at the top, then a ring of FANCY JASPER that is faceted in green/golden colors, and a final ring of FRESHWATER PEARLS. 1-1/2 inch across, 3-3/4 inches long on goldfill earwire. Is there another Earrings Style page you would like to see us add? Please Contact Us by email with your suggestion! This is one of the polishing cloths we rely on in our shop...the Sunshine® Polishing Cloth! It measures 5 x 7.5 inches, has a light cleaner embedded into it that gets heavier tarnish and dirt. Safe for gold and silver. Note that the price goes down with quantity purchases! Beautiful design formed from tiny beads and larger crystals in the colors of bronze, olive green, light green and dark amber, with silver beaded ribbon. All are secured to flexible silver fabric backing. Measures 1-1/8 inches across, and 3-1/8 inches long including the elongated silverplated earwire that has small rhinestones in lower front. 2 inches across, dangling 2-1/2 inches long on golden earwire, these are polished smooth from zero-karat gold. Charles Albert's Alchemia features his "Zero Karat Gold", that has the look and feel of 18kt gold, but is a blend of metals that are nickel-free, lead-free, and lacquered for protection. Flat 3/16 inch goldfill wire is twisted into a large hoop that finishes with extravagant tied bow. The hoop will swing freely from goldfill earwire, overall length is 2-3/8 inches, 2 inches across bow, super lightweight. 3 inches long on goldplated earwire, 1-1/4 inch across. Rigid metal teardrop frame is entirely wrapped in wire that stretches across the center to support rows of faceted beads. They include crystals in bronze, gray and silvermist. Honey-colored topaz gold faceted beads dangle as fringe below. Is it Bohemian or Dressy? We think both! 3-1/4 inches long on goldplated earwire, 1-1/2 inches across. Rigid triangular frames are joined together in a way that allows a little side-to-side movement, as well as graceful swinging. Wire stretches across to gather rows of faceted crystals in verdigri and bronze, gemstone beads of natural tan and yellow jaspers. Earth meets stunning! A lightweight earring that is bold from the extravagant lasercut stainless steel shapes joined together, colored by strong scrolling black-and-white pattern and softer pastels. Colors featured are black and white, pastel yellow, aqua, lavender and peach. 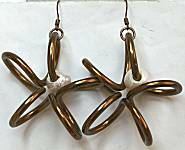 The earrings are rather like an atomic flower, 2mm lightweight aluminum is twisted into endless shape and finished with an antiqued bronze color. At their center is an extralarge white pearl. 2-5/8 inches long on earwire, they will spin a bit to show either the 1-7/8 inch width or 1 inch depth! 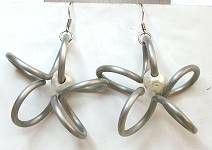 The earrings are rather like an atomic flower, 2mm lightweight aluminum is twisted into endless shape and finished with matte pewter color. At their center is an extralarge white pearl. 2-5/8 inches long on earwire, they will spin a bit to show either the 1-7/8 inch width or 1 inch depth! 2mm lightweight aluminum is curled one direction and then the other for an elegantly simple design, then finished with matte antiqued bronze color. 2-7/8 inches long on earwire, 1-3/16 inch across. 3 inches long on earwire, 1 inch across. Aluminum is turned and hammered into the triangular curl shape, finished in antiqued bronze color, with an extralarge metal bead captured at the bottom. Lightweight, and what a great artistic statement in neutral metal to have in your wardrobe! 2-3/4 inches long on earwire, 7/8 inch across. Aluminum is turned and hammered into the figure-8 "ocho" shape, finished in satin silver color, with an extralarge white pearl captured in the top loop. Lightweight and mathematically elegant! 2mm lightweight aluminum rod is curled one direction and then the other for an elegantly simple design, then finished with darkened copper color. 2-7/8 inches long on earwire, 1-3/16 inch across. The earrings are rather like an atomic flower, 2mm lightweight aluminum is twisted into endless shape and finished with darkened copper color. At their center is an extralarge white pearl. 2-5/8 inches long on earwire, they will spin a bit to show either the 1-7/8 inch width or 1 inch depth! 4-1/8 inches long, 1-3/4 inch across, lightweight. Made with soutache cord in black and dark browns that wind around bronze and black glass and metal beads. Silver metal and glass tube beads join the 3 distinctive sections that include faceted pewter color bead below. Backed with soft black leather, CLIP ON style for all ears. 2 inches long, 1-1/2 inches across, about 3/4 inch deep. A single flattened matte gold plated wire, about 2.5mm wide, loops big on the front, smaller in the back behind the ear. Surgical post at the top of front loop. Large 3-3/8 inches long including goldfill earwire, and 1-7/8 inches across. Polished pewter is almost mirror-like (so keep the fingerprints cleaned off), framed in brass, with granulated brass ball at the top. Bright bits of many color beads are anchored with smokey quartz brown, crocheted with thin golden wire into lacy disks and clusters of various sizes. Earrings are 4-1/4 inches long, 1-3/8 inches across, with goldplated post at the top for pierced ears. 2-1/2 inches long including sterling earwire. These larger earrings are 1-5/8 inch spirals of brass wire hammered into flatter shape, three polished pewter rings slide freely along the spiral (so they might be at the same or different levels)! 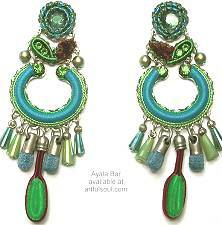 Earring is designed for spiral to extend forward, more visible from the side of face. Go a little bit wild in this organic open shape, formed from tiny beads secured to flexible silver fabric backing. Each shape varies a little bit in length and width, about 1 inch across and 3-1/2 inches long including the elongated and sleek silver plated earwire. The beads are ivory and silver colors. Go a little bit wild in this organic open shape, formed from tiny beads secured to flexible silver fabric backing. Each shape varies a little bit in length and width, about 1 inch across and 3-1/4 inches long including the elongated and sleek silver plated earwire. The beads are metallic bronze in color. Ornate shapes lasercut in stainless steel, beautifully joined together for a graceful larger earring. Patterns are under clear acrylic domes, ivory-like resin stone at the bottom, and crystals in pacific opal and champagne colors dot all pieces. Colors featured are aqua, vanilla. Earrings are 2-7/8 inches long, 5/8 inch across, surgical post at top. Goldplated frames are joined in simple interlocking rings line, with shape and color diversity that is dressy and intriguing. Swarovski crystal colors work from amethyst and tanzanite purple into a large hematite gray at the bottom. 3 inches long on goldplated earwire, 1-1/4 inch across. Rigid metal teardrop frame is entirely wrapped in wire that stretches across the center to support rows of faceted beads. They include crystals in teal blue-green, black diamond, misty gray and translucent ice. Fresh minty green faceted beads dangle as fringe below. Is it Bohemian or Dressy? We think both! 3-1/4 inches long on silverplated earwire, 1-1/2 inches across. Rigid triangular frames are joined together in a way that allows a little side-to-side movement, as well as graceful swinging. Wire stretches across to gather rows of faceted crystals in jet black, hematite, smoke and translucent ice. Like black-and-white rainbows for your ears! 2-1/4 inches logn including silvertone earwire, 1-5/8 inch across. Resin circle is smooth and flat with satin finish, it has a luminious shell-like quality within, a luminous dark tangerine orange color. 2-1/4 inches long on surgical earwire, 1-1/4 inch across. Lead-free pewter dangle is a slightly domed open oval shape with brushed shiny top surface, blackened in the deep recessed pattern. Curving bands weave across the surface like waves or tree bark, a look that is both natural and artsy deco at the same time. Simple and everyday stylish. 2-3/8 inches long including golden earwire, 2 inches across, and very lightweight! Flat weaving forms an arc suspended from tan wrapped legs that join at the top with golden wire wraps. The weaving incorporates cord colors of tan, coral orange, moss green. Turquoise beads are incorporated into the final row. 2-3/8 inches long including silvertone earwire, 2 inches across, and very lightweight! Flat weaving forms an arc suspended from black wrapped legs that join at the top with silver wire wraps. The weaving incorporates cord colors of black, gray and white. Black beads are incorporated into the final row. 3-3/8 inches long including surgical earwire, 1-1/2 inches across, 1/2 inch deep. These will move to offer a different vantage point, in featherweight wearability. Stainless steel wire is turned and twisted to form the rings that are dipped in resin to capture transparent color. Dark berry pink and lime green, the color is clearer toward the center. 2 inches long, 1-1/2 inches across, about 3/4 inch deep. A single flattened rhodium silver plated wire, about 2.5mm wide, loops big on the front, smaller in the back behind the ear. Surgical post at the top of front loop. 3-5/8 inches long including surgical earwire, 1-3/8 inch across. Large teardrop with open center has texture like rumpled cloth, cast in pewter and antique silver plated. Lead and nickel free. 3-3/8 inches long including golden earwire, 1-3/4 inch across. Rings of Italian acetate that is strong and lightweight, are joined into a lightweight larger earring. The color is tonal shades of ivory. 3-3/8 inches long including golden earwire, 1-3/4 inch across. Rings of Italian acetate that is strong and lightweight, are joined into a lightweight larger earring. The striped colors are ivory and gray. 3-3/8 inches long including golden earwire, 1-3/4 inch across. Rings of Italian acetate that is strong and lightweight, are joined into a lightweight larger earring. The color is marbled turquoise blue. 2-5/8 inches long including golden earwire, 1-3/8 inch across. Italian acetate in filigree pattern is lightweight and strong. The color is marbled turquoise blue. 3-1/8 inches long including surgical earwire, 1-1/4 inch across. Squared wire outlines a triangle and pyramid cap motif. Cast in pewter and antique silver plated, lead and nickel free, weigh less than 1/2 ounce for the pair. Large and dramatic, CLIP ON style for all ears. 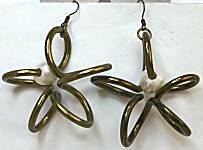 These are 4 inches long, 1-3/4 inches across, made from fine metal mesh that is gently folded, the top blossom is soldered onto a metal disk for comfort. The colors are deep copper orange blended into raspberry, leafy drops in dark aqua graduating to antique gold. 3-3/8 inches long including surgical earwire, 1-1/8 inch across. Crescent shape hangs from chains with bead swinging between, cast in pewter and antique silver plated. Lead and nickel free. Large crystal on top holds the fabric covered elements below...a circle of cords, then folded print cords, with a final large loop of striped cords and silver metallic beads. Crystal fringe adds the sparkle. 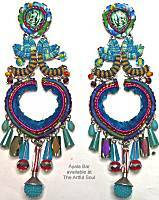 Amazingly lightweight for their large size, these earrings feature color cords and fabric wrapping, working around and between fabric under glass and beads. 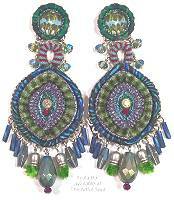 Crystal beaded fringe really catches the eye when the earrings move. Amazingly lightweight for their large size. Print under glass framed by cord at the top holds up the loop of striped cord and the largest element in this design. In the larger element, you can see subtle texture changes from fuzzy cord, to striped and metallic. The earring fringe mixes glass, crystal, and fuzzy fabric tucked inside silver metallic caps. Circles joined together, filled in at the top with crystal bead, color metallic coil and fabric cord, then an open loop of printed fabric wrapped around a cord. Dancing below is a striped cord curve, crystal beads, and a net-covered bead under silver metallic cap. Floral print under glass at top framed by striped cord, more striped and printed cords encircle the large drop swinging by dual jump rings below. Dangling crystal beads at center moved lightly, larger bead drop below. 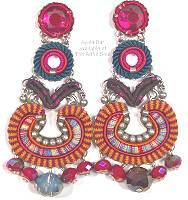 Big WOW of an earring with length and width to fill up the space under your ear with beautifully rich color. 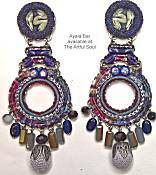 A print under glass at the top framed by beads, mosaic hanging below from dual jump rings will swing slightly to carry the earring size without weighty drag, filled with more glass beads, a pair of prints under glass, midnight blue crystal at center. Beaded fringe includes the pretty dark aqua glass faceted taper. Juniper Collections features richly saturated teal blues softening into dark aqua, brightened by splashes of light emerald green and orange-red fire opal, beaded mosaics mix with multicolor print under glass that keeps the busy details strong. Not all colors appear in every item. Big WOW of an earring packed with colors of the collection and a graceful shape to drape alongside the neck. At top are a pair of prints under glass framed by glass beads, then a pair of curves below filled with red and blue metal coils hold onto the various smaller mosaic pieces that sparkle with glass and crystals. Beaded fringe will dance the night away. Rowan Collection features multicolor of gemstone hues like ruby red, peridot, dark aquamarine, pink sapphire, fire opal orange, in richly beaded patterns with prints under glass. Not all colors appear in every item. Beautiful and bold but not heavy, at top a green crystal is framed by threaded border, cords and tufted fabric gather below that, then a curve of metal holds green chain and turquoise coil. Beaded fringe includes handmade fabric components. Cornelia Collection features vibrant turquoise, Kelly green, and dark red, wonderfully unique handmade fabric components that make a bold statement. Not all colors appear in every item. 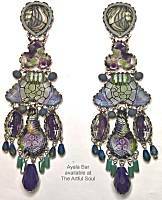 Large, long, dramatic, wonderful earring if you have the occasion! The open spaces keep the weight down, but the curving designs filled with tiny glass and crystal mosaic components carry the color impact. Tonal print under glass at top, curve of color cord and beads below holds up the rest of the curving mosaic sections, dual hinged for graceful movement. Clarity Collection features darker aqua and dusty turquoise green in a soothing monochromatic color scheme of tiny glass and crystal beads, tonal prints subtle under glass. Not all colors appear in every item. Fat teardrop mosaic at top with crystals, faceted glass and cord, holds ornate shapes below filled with more mosaics and finishing with beaded fringe, lightly swinging without being heavy on the ear. Special occasion elegance in the neutral metallic colors and larger design. Sparkling crystals mix with matte glass and glowing pearls. The mosaic elements are shapely and joined by multiple jump rings for the exotic shape, that has a subtle print under glass in the bottom piece before gray pillow pearl drop. 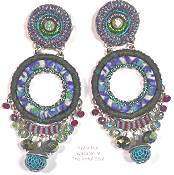 Showstopper earring with mixed print collages under glass, the various shapes are joined by multiple jump rings with a sweeping frame of color cords surrounding the freely swinging circle at center. Dancing beads off to the sides and bottom, with the large silver metallic bead at finish. 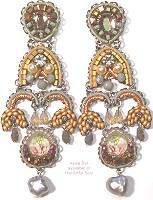 Warm colors of fall leaves in fabric and beads, the top circle has glass center with fuzzy cord around it, then the tulip/stem shapes below in colored and striped cords hold the larger open diamond shape that incorporates a little splash of other colors and metallic cord. Beaded fringe adds shine and multiple surface reflections. Larger/longer earring, not too heavy in the wrapped fabric beads and open negative spaces. But this is showy with print under glass at the top and all the printed wrapped cords, metallic fuchsia coil, and sparkling bead fringe. Interesting texture bead under metal cap at bottom. Bold and big with lightness of weight, rich colors of crystals, metal coil and fabric in sweeping shapes are joined by jump rings for subtle movement. Lower striped cord intrigues with fuzzy texture. Shiny glass-covered prints in mixed florals are unified with common colors, joined by jump rings for a longer shape and finishing with dancing crystal glass bead fringe. Print under glass at top surrounded by texture fabric cord, holds up a larger drop of cords with dots of AB crystals. Beaded fringe includes matte lavender texture bead under metal cap. For more, try a Search of our website database.